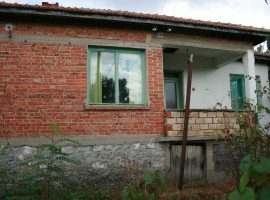 The property is situated in the village of Polyana and set on the edge, with outstanding views of the countryside. 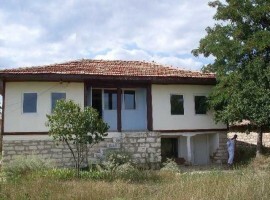 The plot area is 2235m2 with the 2 storey house sitting on 90m2. There is plenty of off road parking available through double gates at the front of the property. There are 4 large outbuildings suitable for storage, animals or developing into further accommodation. The property benefits from a large front&side lawned area and fenced patio&chipping area. There is also a large rear garden suitable for growing fruit and vegetables. There is a Well on the property. The ground floor of the house is accessed via double pvc doors entering the hallway(3.2m x 3m) which gives access to the 1st reception room(3.25m x 3.5m), storage cupboard, wetroom/wc(2.1m x 2.8m) and kitchen(3.35m x 4.45m) which has modern pine, custom made fitted units. Via the kitchen is the 2nd reception/dining room(3.25m x 4.6m) which has double pvc doors leading out to the rear garden. There is also an internal wooden staircase leading to the first floor. The first floor consists of a landing area(3m x 3m) with access to bedroom 1(4m x 3.8m), bedroom 2(4.8m x 3.9m), bedroom 3(3.7m x3.8m) and a modern fitted bathroom(3m x 1.9m). The house is a brick built construction with stone foundations. It has all new pvc double glazed windows and doors. There has been repairs to the roof and chimneys. New electrics were carried out by EVN. Internet connection. Mains water and water boiler. The property comes part furnished and includes white goods no older than 2 years(very large chest freezer, large fridge freezer, dishwasher, washing machine and cooker.) The house is heated with 2 Prity woodburners which are included. A bedroom suite, 2 single beds and a corner sofa. There is also an above ground 15ft intex swimming pool. The property is a 2 minute walk away from the centre of the village. The village has a post office, bus service, small church, visiting doctor, 2 shop/bars, 1 shop/bar/cafe and a small children’s play area. There are opportunities for hiking, fishing and hunting. Polyana is located in the South-eastern region of Bulgaria. It has a population of around 250 people. It is 35km from the large town of Yambol where you will find many shops, cafes, hotels, restaurants etc and transportation links to the whole of Bulgaria. 88km away is the Coastal City of Burgas where the nearest international airport can be found.